[Updated] The Bermuda Economic Development Corporation [BEDC] is holding their award presentation this evening [Aug 30] honouring the young people who completed their Summer Student Entrepreneur Programme [SSEP]. A spokesperson said, “Since early July, the scheme has walked ten young people between the ages of 14 and 20, through the challenging process of starting and growing their own businesses. “The goal was to provide educational tools and financial resources, as well as weekly accountability, to give them the best chance at success in turning their ideas into hard earned cash this summer holiday. Gemstone jewelry, commemorative photos, bird boxes, natural skin care products and pet sitting were a few of the businesses that were operated by the young entrepreneurs as part of this programme, and you can view our past coverage of the programme here, we will have additional coverage later on and the live video is below. Update 6.36pm: The first place winner was Kayuntae Ming, Jaden Taylor was awarded the second-place prize; while 14-year-old Andreaz Glasgow took home third place. 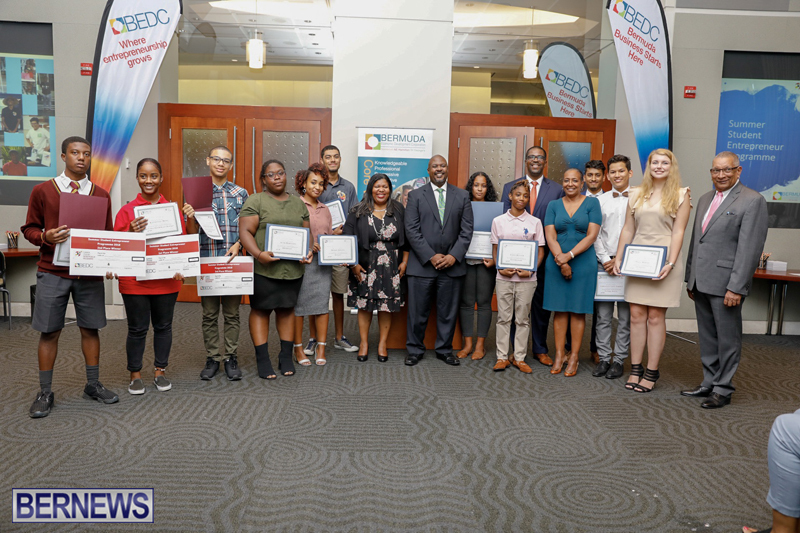 A spokesperson said, “Ten young people enrolled in BEDC’s pilot Summer Student Entrepreneur Programme [SSEP] were celebrated this evening for successfully completing the eight-week education and training scheme, spearheaded by Bermuda Economic Development Corporation [BEDC]. “A ceremony was held for the budding entrepreneurs at XL Catlin, located at 1 Bermudiana Road, Hamilton, with family members, sponsors and representatives from a variety of Government Ministries in attendance. Minister of Economic Development and Tourism, Jamahl Simmons, JP MP, along with BEDC Executive Director Erica Smith presented participants with certificates of achievement. “In addition, the students competed against each other on business sales with the top three business earners who brought in the most revenue during the summer months being awarded prize money for their hard work and determination. Naeem Alom, the SSEP Programme Coordinator, said: “It’s been an honour watching all ten of these students grow over the past eight weeks. I’m extremely proud of them. Some of the students have decided to take their businesses to the next level, including one who is already selling their products at a local store. BEDC added, “SSEP was launched on Monday, July 9, 2018, after receiving full support and grant sponsorship from the Ministry of Economic Development and Tourism. The programme aimed to develop local young people into the Island’s next wave of entrepreneurs by providing them a safe environment and support to test out if their business idea was a viable career option. Erica Smith, BEDC’s Executive Director, congratulated the young people who participated in the pilot SSEP initiative at last night’s award presentation. She said: “BEDC has enjoyed getting to know each and every one of you over the course of the Summer Student Entrepreneur Programme. Many of you have utilized our office space or been hard at work selling products and services at Harbour Nights on Wednesday evenings or in the intense summer heat in Dockyard and at the Olde Towne in St. George’s. “Through SSEP, each of the ten students were eligible to receive a working capital advance from the BEDC to help towards start-up costs and the launch of their business idea. “The first week of the scheme was devoted to workshops and educational training to teach them the fundamental principles of entrepreneurship including customer service, marketing and basic financing. 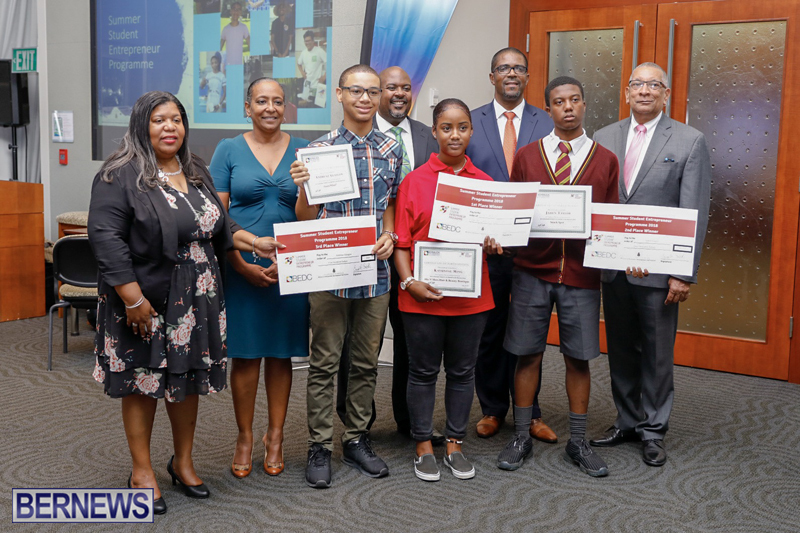 In subsequent weeks, the students were out executing their business ideas in locations such as Dockyard, Hamilton and St. George’s, and were required to attend a weekly progress meeting at the BEDC to report on their growth. “The success of the programme was made possible thanks to support from various Government departments including the Department of Health, which provided students with six week temporary health certificates and licenses at no cost; the Department of Parks, which helped several students set up their enterprises at Horseshoe Bay Beach and the Bermuda Chamber of Commerce, who provided all ten students with a space at Harbour Nights. “Additional support was provided by the West End Development Company [WEDCO], which granted five students permission to sell their products and services in Dockyard, the Corporation of Hamilton, which granted two students space in Hamilton, and the Corporation of St. George’s, which granted one student space in the Town, all gratis. “Other students recognized at the award ceremony included: Paige Martin, Kalir Stevens, Asah Robinson, Tyler Trott, Christian Chin-Gurret, Asia Atienza and Yndia Raynor.